This superb location in the very heart of Venice is a fantastic place to base oneself while visiting this beautiful and historic city. This exceptional 4 star hotel is in the immediate proximity of the Church of Santa Maria della Pieta and just 400 metres away from St Mark's Square. This marvellous historical property was once the residence of Antonio Vivaldi, the famous Venetian composer. His concertos where first heard in the Pietà, just next door to the Hotel Locanda Vivaldi, where he served as a priest until 1708. As well as being steeped in history, the Hotel Locanda Vivaldi embodies lavish Venetian style and elegance in its decor and ambiance both inside and out. The hotel offers 27 classically decorated guest rooms and a well equipped business meeting room, housed in two separate buildings adjacent to one another. These 18th and 19th century typically styled Venetian rooms boast beautiful parquet floors adorned with oriental rugs and the walls are covered with fabrics and original wall hangings, elegant window drapes with high ceilings and Murano glass chandeliers. A number of rooms (available upon request when you book online) are also equipped with Jacuzzi or shower facilities. All other bathrooms are fitted with bath and shower, hairdryer and Vivaldi themed complimentary toiletries. 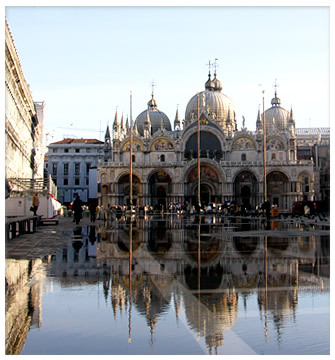 The Hotel Locanda Vivaldi is perched right on the waterfront promenade facing Venice’s lagoon. There are some stunning views from various rooms within the hotel but for some truly breathtaking panoramas of the lagoon and waterfront our third floor bar and restaurant is the place to be. Guests can enjoy a drink on the terrace at any time but our restaurant is open for dinner only in the summer months. The first floor Gritti bar is another option for a quiet drink. Why not arrive at the Locanda Vivaldi in style by disembarking at the hotel's very own private wharf - you can arrive or arrange to be picked up by Gondola or water taxi. Once inside our reception area you can choose to relax in our lounge area, decorated in stunning marbles and antique furniture.